Great place to stay!! Very clean and great location! Would stay here again for sure! Thanks Dan. Hope you enjoyed your trip to this great part of Ontario. Very nice and clean place. It's close to the village with a lot of stuff to do. I recommanded it to every little family. 30 minutes to Wasaga beach. We had a fantastic week in Blue Moutain Village. The property and its location was great. The whole experience was exceptional from booking to check out. Geoff responded quickly to all correspondence and provided us with useful tips about the area, places to shop and eat etc. The property was spacious, very clean and comfortable for our group of 6. The apartment is a short walk from the village and 10 minutes drive from Collingwood. The pool, complete with lifeguard, is a great addition to the facilities and is very close by with space to relax and sunbathe. We were able to explore the mountain trails, the lake especially Wasaga Beach and travel to Barrie and Canada's Wonderland. A very enjoyable stay - highly recommended. Geoff was an excellent host and great at communicating. His place is absolutely beautiful with a great view of Blue Mountain! The place was a great size, clean, comfortable and organized. It is perfect for a family/group. Ski hills and village are within walking distance so it is very convenient. I would definitely recommend this location and I plan to book again at some point in the future! Thanks for the kind words Monica. Glad you enjoyed your weekend. We'd be pleased to have you stay with us again. Let me know when. 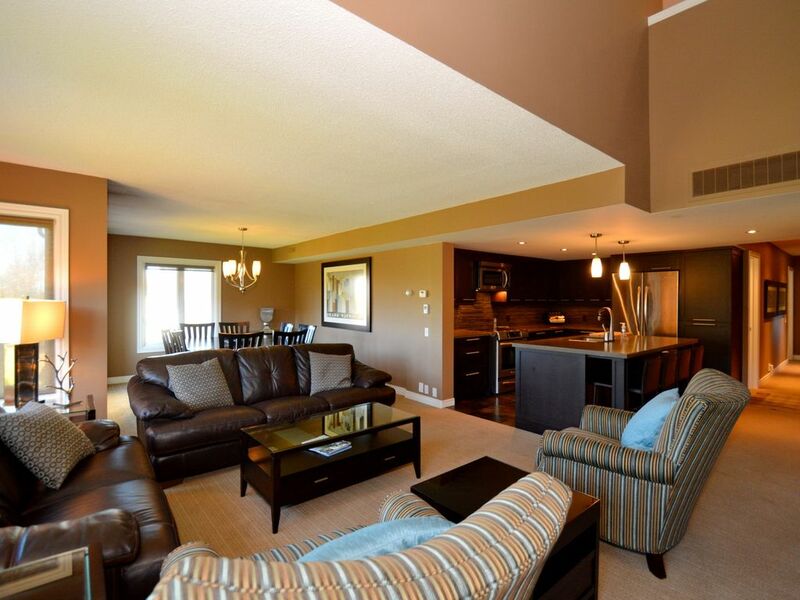 Very nice condo, very quiet near the Blue Mountain Village and golf ! High quality condo with a luxury touch, we realy enjoy our stay! Owner are very good people and give an A1 service. I had to write a review to compliment this property and the owners who made our multiple stays so enjoyable. My family of 4 thoroughly enjoyed this spacious, well appointed condo that was just minutes away from the village and slopes. I was a non-skier this year and found myself enjoying their beautiful kitchen to make some gourmet meals for the rest of the gang. The owner was very responsive and answered all of my questions and followed up with us during our stay to make sure everything was in order. I would definitely recommend this property for those wanting a peaceful and luxurious Blue Mountain getaway. Thanks CB for the kind words. We're thrilled you guys enjoyed your time at our home at Blue and that it provided you with some warm relaxation and comfort after a long day of skiing and cooking. Indeed I doubt the kitchen has ever seen such a high level of use; I'm glad it was up to the task. We would be pleased to have you as our guests again. La région de Collingwood / Wasaga Beach / Blue Mountain est un animé avec une activité toute l'année. Ski / motoneige / raquette / etc ... En hiver; échouage / randonnée / vélo au printemps / été / automne. Repos et détente au célèbre Scandinave Spa - seulement 3 km de notre place. Il ya aussi une variété de festivals qui ont lieu tout au long de toute l'année, y compris le célèbre Festival Elvis de Collingwood. Il ya vraiment trop de nombreuses activités et événements importants à signaler, mais rassurez-vous il ya quelque chose pour tout le monde de tous les âges et intérêts. ** WEEKLY bookings are based on Friday to Friday so that subsequent guests can also enjoy a full weekend. ** Please select Canadian Dollars from the currency pull down menu to ensure most accurate price quotes. Rates are subject to change until reservation is confirmed in writing. Bookings are held for 48 hours once availability is confirmed and the Occupancy Agreement has been provided. Renters must be a minimum of 25 years old. STRICTLY: NO PETS. NO SMOKING. NO PARTIES.